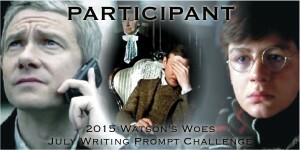 The following stories were written for the July Writing Prompts Challenge at watsons_woes. They are all written quickly and most involve John Watson not having a very good time, generally. Beyond that, see individual posts. All are BBC Sherlock unless otherwise noted. Prompt #13 - Fortune Favours the Wet [PG-13 (with one R-rated word)] - There was something to be said about the quiet of the bottom of a well. Prompt #20 - I Think I'll Go For a Walk [PG-13] - A minor accident in the flat ends up being a major annoyance for John. Title is a quote from Monty Python and the Holy Grail. Prompt #27 - The Morning Cuppa [PG-13] - Mornings take some getting used to in 221B. Prompt #28 - Killer of the Countryside [PG-13] - John takes a case in North Yorkshire that Sherlock won't bother getting off the sofa for. It doesn't go well. Prompt #29 - Run Boy Run [PG-13, 221B] - Some nights you're the pursuer, other nights you're the pursued. Prompt #30 - Nothing to Phone Home About [PG-13, One sided telephone monolog from a character in ASiP] Welcome to London. And the 2013 participant banner! Prompt #1 - Shipshape [PG-13] Warning signs are only helpful if you see them. Prompt #2 - The Devil's Pet Bait [PG-13] Seems an awful lot of trouble to go to for a pretty rock. Prompt #4 - Becalmed [PG-13] Sherlock's not the only one who goes a bit odd when there isn't a case. Prompt #5 - The Piano Tree [PG-13] They don't know art, but they know what they like. Prompt #6 - Criminal Floriography [PG13] Sherlock, arranging a lovely bouquet of flowers for John to give to his date? John really should have known better. Prompt #8 - Ratigan's Reprehensible Retribution [PG-13 Crossover: Great Mouse Detective] Ratigan has a plan to get his final revenge on that annoyance Basil, and nothing will stop him! Not even humans! Prompt #12 - Casu Marzu [PG-13, WARNING: Major food squick] The deadliest cheese in the world, though mostly not literally. Prompt #13 - A Clear Distinction [PG-13] This was not listed as a side effect of Sherlock's medication. Prompt #14 - Voice of Command [PG-13] Whatever gets the job done. Prompt #15 - The Curious Incident of the Owl in the Daytime [PG-13, Crossover: Harry Potter] 221B has an atypical caller. Prompt #16 - Upper Limit [PG-13] There are some things up with which Greg Lestrade will not put. Prompt #18 - Ad Astra [PG-13] It's a ceremony they can't not attend. Even though no one told them about it. Prompt #20 - Unsettled Conditions [PG] A little preparedness would go a long way. Prompt #25 - Evacuate the Dancefloor [PG13, Spoilers for 3.02] Sherlock Holmes, dance beast. Prompt #27 - A Conspiracy of Cooks [PG13] When John had to leave that first plate of pasta half-eaten at Angelo's he understood. Extenuating circumstances; trying to catch a killer. But it just kept happening. Prompt #30 - The Mousetrap [PG13] John drags Sherlock out to see a play, with predictable results. Prompt #1 - For Want of a Tea - [PG13] An urgent matter for Sherlock becomes a pain in the neck for John. [The Adventures of Sherlock Holmes and Dr. Watson, Russian, 1979. PG13] To foil a deadly plot, Watson must keep a watchful ear on the night-time halls of Bedlam. Warnings: References to Victorian Mental Health practices and commentary on them. Prompt #3 - A New Leaf - [PG13] In Afghanistan, John takes a quiet moment to muse about leaves. Prompt #4 - Been There, Done That - [PG13, established John/Mary] Even when it's all expenses paid, choosing a place for their honeymoon proves difficult for John and Mary. Prompt #6 - An Exercise in Drama - [PG13] Sherlock and John engage in recreational zoomorphism for a case. Sort of. Prompt #7 - The Baking Invasion - [PG13] Sometimes gratitude can go too far. Prompt #8 - Negative Afterimage - [PG13] An afterimage is a non-specific term that refers to an image continuing to appear in one's vision after the exposure to the original image has ceased. Prompt #9 - Consequences - [PG13] - John won't save Sherlock. Not this time. Not from a complete and deliberate failure of chemistry experiment safety, common sense, and the scientific method. Prompt #11 - Coat Comfort - [PG] After a long case there's only one thing to do. Prompt #12 - A Dog's Tale - [PG, Young Sherlock Holmes] A scene from Young Sherlock Holmes from the viewpoint of its hero, a small, mostly white terrier. Prompt #13 - An Investigation of 'My Future Life' by Johnny Watson - [PG] Sherlock is shocked by John's ability to predict the future at the age of seven. Prompt #14 - Phyllobates terribilis - [PG13, Elementary] Deadly things come in small bright packages. Prompt #15 - A Fly-by-Night Operation - [PG13, Elementary] Sherlock and Joan view a possible goose-related crime scene. Prompt #16 - The Fire - [PG13] When John wakes up, his room is full of smoke. Prompt #17 - We'll Call It A Draw - [PG13] John knew the type. Jovial, trying to make the medics laugh, go out making everyone smile, even a little. He didn't think he'd be one but you discover a lot about yourself when you're dying. Prompt #20 - Linguistic Drift - [PG13] The French accent would definitely not have worked. Prompt #21 - Sunbaked - [PG13] A rotation at the multinational base hospital turns up more cases of injury by boredom and lack of thinking than by any sort of combat. Prompt #22 - Dear Doctor Watson - [PG13, Part Graphic] The notes were never actually for him. Prompt #23 - The HAT Trick - [PG13] "John, I realize that technically I may have just incurred a head injury, but.... are you braiding my hair?" Prompt #24 - Mrs Hudson's Boys - [PG13] They were grown men and could certainly take care of themselves, but sometimes a little well-meaning manipulation was required. Prompt #25 - Sad Songs Say So Much [PG13] The poems were easier to take than the songs. Prompt #26 - The Secret Keeper [PG13, OC outsider POV] After all we'd been through, I wouldn't miss her wedding, even though she wasn't using any of the names I knew. Prompt #27 - Ghosts in the Room - [PG13, implied animal death] John was overdue for a pub night with his old friends. He had every right to a pub night with his old friends. Why could he not stop worrying about Sherlock? Prompt #28 - The Deal - [PG13] The odd smell that built as he mounted the stairs should have prepared him for what lay ahead, but he stopped still as John turned to enter the kitchen. Prompt #29 - Pack Behaviour - [PG13] The one thing that made this worse than Baskerville was that this time it was real. Prompt #30 - Prognostication Rumination - [PG13] "Bit grim, this." Prompt #31 - For a Good Cause - [PG13] John shot a nervous glance through the crack in the curtains, "Why me?" My 2016 JWP entries collected on AO3. June Pre-JWP Prompt - I See You Shiver With Anticip.... (AO3) - [PG13] "No," John said to the gold lamé shorts. Prompt #1 - Full Disclosure (AO3) - [PG13, Sherlock Holmes (RDJ)] A message brought by an Irregular provides Holmes more information than Watson intended. Prompt #2 - True Blue Friendship (AO3) - [PG13, Young Sherlock Holmes] Watson discovers he now has an ally against the bullies who keep tormenting him at Brompton Academy. Prompt #3 - The Blackwall Box Man (AO3) - [PG13, Sherlock Holmes (Granada)] When Inspector Lestrade brings a cold case to 221B Baker Street, Holmes and Watson prove it to be not nearly as cold as first thought. Prompt #4 - Shell Game (AO3) - [PG13] Just a minor breakfast apocalypse. Prompt #5 - Aging Gracefully (AO3) - [PG13] "SHERLOCK HOLMES! YOU ARE NOT USING MRS HUDSON AS BAIT!" Prompt #6 - Sitting to Breakfast (AO3) - [PG13, Russian Holmes (1979)] Mrs Hudson could tell she would become very fond of her new lodger. Prompt #7 - Vectors (AO3) - [PG13] John muses on the joys of flu season. Prompt #8 - Reach Out and Touch Someone (AO3) - [PG13, Great Mouse Detective] When a crisis demands Basil and Dawson take action to save a human's life, they use cutting edge human technology. Prompt #9 - A Handful (AO3) - [PG13, Elementary] Marcus tries to make a furry little friend. Prompt #10 - Mutual Annihilation (AO3) - [PG13, Sherlock Holmes (RDJ)] The second stage of grief is anger. Prompt #11 - Tea and Angry Biscuits (AO3) - [PG13] By the time John got himself down the stairs he should have known Mrs Hudson would have abducted Lestrade. Prompt #12 - The Center of Attention (AO3) - [PG13] The corpse was the least interesting object in the room. Prompt #13 - Quiet Until Provoked (AO3) - [PG13, Warning: Violence] He should have brought his gun. Prompt #15 - The Scottish Ploy (AO3) Cases like this are what made Sherlock turn to telecommuting. Prompt #16 - Standing By, Innocently (AO3) - [PG13, CROSSOVER: Sherlock/Merlin] For someone so obviously elderly, John marvelled as he ran, the old man can hustle. Prompt #17 - A Friendly Game (AO3) - [PG13] John did try to get Sherlock to give Anderson a second chance. Prompt #20 - Caught in the Undertow (AO3) - [PG13] On review, John thought as he sailed over the railing, getting into a brawl with a murderer on Tower Bridge had not been a wise choice. Prompt #21 - Just Around the Corner (AO3) - [PG13] John discovers that when Sherlock is deep in a case and won't eat, sometimes it's better to leave it to the experts. Prompt #22 - How We Rescued My Daddy From His Bad Friends (AO3) - [PG13] (Image fic.) This is Mr Sherlock. He's not a nice man but he's a good man because he found my daddy. He wasn't wearing his hat but I drawd it in anyway. Prompt #23 - The Case of the Midnight Shaving (AO3) - [PG13, Sherlock Holmes (Granada)] The man standing in the doorway of our sitting room flushed furiously, right to the top of his bald pate. "I demand my case be taken seriously!" Prompt #24 - A Measure of Revenge (AO3) - [PG13] Household accidents are quite common in general, but their frequency in 221B Baker Street might skew the statistics a little. Prompt #25 - Together, They Fight Crime! (AO3) - [PG13] Crack. Prompt #26 - Walking Against the Wind (AO3) - [PG13] I can't hear my fire team over the comms anymore, just the hissing roar of the sandstorm. Prompt #27 - Communications Breakdown (AO3) - [PG13, text-fic] John doesn't get the message. Prompt #28 - Advanced Strategies in Thermal Regulation (AO3) - [PG13] A heatwave in London is a damp, heavy, grimy thing, like a giant washing-up sponge pressing down on the city. Prompt #29 - When Timbers are Shivered and Lillies are Livered (AO3) - [PG13] Mycroft did tell him about Sherlock's childhood career plans, but John hadn't quite reconciled the image with his mad flatmate, until now. Prompt #30 - Helping Hands (AO3) - [PG13, ACD Holmes/Granada] The sacrifices one makes for science. Prompt #31 - Eine Kleine Nachtmusik (AO3) - [PG13,Elementary] Joan Watson has had enough.